What a lovely idea and a great way to start Spring- at least for we bloggers (and gardeners!) in the Southern Hemisphere, that is! I have been nominated for this award by the lovely Lisa, from http://www.fromdreamtoplan.net. Lisa writes a great travel blog and is always so positive, enthusiastic and full of life! She also has a lovely singing voice and enjoys making handmade gifts, so if you love travelling, music and creativity, it is well worth following her blog! 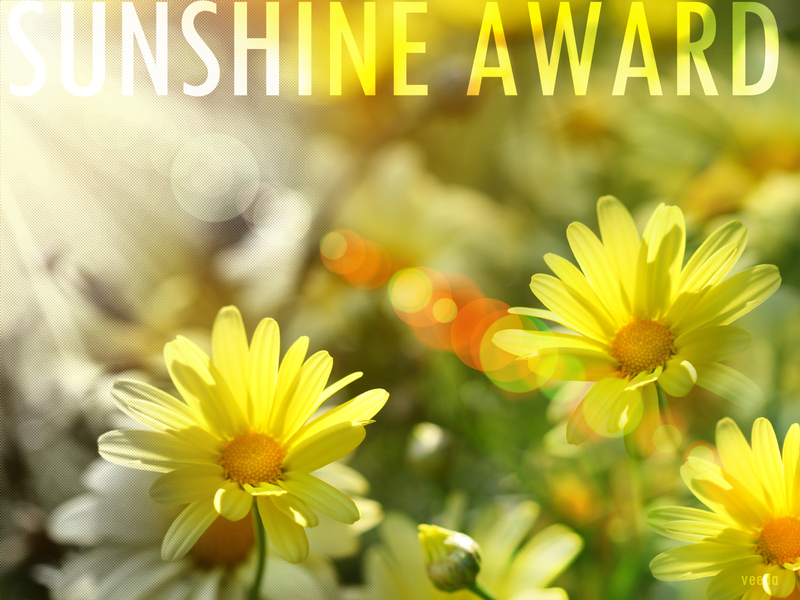 The Sunshine Award is given by fellow bloggers to bloggers, who ‘are positive and creatively inspire others in the blogosphere’, so Lisa certainly deserves her award and it’s so lovely that she enjoys my blog too! I get so much joy from my garden, the beauty of our local environment and the natural world and from developing my creative side, and blogging has been a wonderful way to share that happiness, as well as meet some wonderful, positive, like-minded people from all over the world in the process! So thank you again, Lisa! 1.What are the challenges that you face in writing an article? Keeping the word count down and being selective about the photos I use! Sometimes, I will post an article over 2 weeks, if it is more than 5000 words and can be divided into two logical parts. Trouble is, there is always so much to write about!!! The same goes for the photos and they are even harder! I hope that I am improving slowly!!! I think that I may have already answered this question in my introductory blurb! I love my garden and seeing all the new growth, especially at this time of year, when the garden is very very slowly starting to wake up after a long Winter! The excitement of the first new leaves unfurling, the first daffodil opening, the first crab apple flower- I pop down into the garden at least 4 times a day to check on its progress, to help Ross out or pick flowers for the house. I love flower arranging- all the scents, colour, textures and forms- and easily lose myself in this other world! Nature, birds, our precious environment and beauty are also strong motivational factors for me! 3.What is your favourite travel destination? This is a difficult one! There are so many wonderful places to visit and we have enjoyed all our holidays! This time, I might nominate Lord Howe Island off the east coast of Australia- well worth visiting if, like us, you enjoy bushwalking, beautiful natural environments, cycling, swimming and snorkelling and bird watching. It is a pretty special place! For more information, read my post on Landmark Birthdays: Part 1 at: https://candeloblooms.com/2016/05/31/landmark-birthdays-part-1/. 4.Do you speak any foreign languages? I learnt French at school for 4 years and while I don’t get a lot of opportunity to practise it, I have used it at a very basic level on our two trips to France, as well as translating a book, written totally in French, about one of my favourite Old Rose gardens in Lyons, which leads to my next question…! 5.List 3 things on your bucket list. Given Lisa asked the question and is a travel writer, here is my travel bucket list! To visit the Old Rose gardens of Europe, in particular the subject of the book, which required translation: Odile Masquelier’s wonderful garden, La Bonne Maison, in Lyons, as well as Eléonore Cruse’s blowsy rose garden ‘Roseraie de Berty’ at Largentière, Ardeche and of course, the Garden of Ninfa in Lazio, south of Rome, Italy. To visit more gardens in Britain: Sissinghurst, Sarah Raven’s Cutting garden, Great Dixter, the Old Rose nurseries of Peter Beales and David Austin, the gardens of the Cotswolds: Hidcote Manor, Kiftsgate Court, Snowshill Manor, Barnsley House, William Morris’s Kelmscott and Prince Charles organic garden at Highgrove, Montisfont Abbey… the list is endless! And finally, on the way home: the beautiful exotic tropical paradise of Tahiti! 6.What is the favourite thing about yourself? Another toughie, but I would probably have to say my adaptability! We have lived in a number of different places and led a number of different lives, all involving fresh starts and lots of variety and interest! Life is never boring! 7.If you could have a superpower, which one would you choose? Probably the ability to time travel, as I love history, as well as visiting new places! 8.What is your favourite recipe of all time? I love desserts! It’s the basis of my menu planning! And I love tropical fruit salad, so my choice would have to be: Fruit Salad with Ginger Mint, Served in a Carved Watermelon. I have made this dessert a number of times and love it for its variety of flavours, colours and creativity. It is great fun carving designs on the melon bowl and you can vary the fruits used, plus the syrup includes lime juice and orange flower water- always a winner! See my post on The Sweet Spot at: https://candeloblooms.com/2015/10/01/the-sweet-spot/. 9.Which is your favourite movie of all time? I love Mamma Mia: The Movie for its joyous music, beautiful Greek island scenery, fabulous dance scenes and just sheer fun! It always makes me feel good! 10.How long have you been blogging? One whole year on September the 1st! 11.When did you start your first blog and if it’s not the current one, what was it? What are the most important factors for a happy life and why? What is the most beautiful place you have ever visited and why? Name 3 people who inspire you and say why. If you could time-travel, which time period would you visit and why? What is your favourite garden, apart from your own of course! ? Before blogging, what did you do with your blogging time?! I enjoyed reading your answers, nice to know a bit more about you! That salad sounds so good and Mamma Mia is such a good movie!! Thank you so much for nominating me for the Sunshine blogger award, I’m honoured that you included me, however I make it a rule not to participate in these various awards. I will continue to follow and enjoy your posts and I’m looking forward to seeing spring arrive in your garden while mine slips into winter. Enjoyed reading your answers. So who won the award? Thank you! It’s always fun thinking about your answers! The lovely thing about blogging awards is that there is no competition aspect involved. Bloggers are nominated by fellow bloggers for these awards as recognition and encouragement and it’s a great way to increase your readership, as well as expanding your own personal exposure to the blogging community all over the world. It’s lovely to make your acquaintance and I look forward to reading your blog!